Recently, the folks from Corel came to town, treating us to a demo of the new Pinnacle Studio 16 Ultimate, a capable video-editing program with some innovative features. While this won’t turn up at major facilities anytime soon, this new release has chops that will satisfy the needs of the most demanding prosumer users, with probably a few producers and ad execs thrown in too. If you’re familiar with this part of the market, it might be a surprise that Studio is now a Corel product. Until this past July, Avid owned the NLE as part of its consumer division. Seeking to concentrate solely on the pro market, Avid sold the Pinnacle product line as well as M-Audio, its prosumer music hardware and software company. Watching the Pinnacle Studio 16 demo, I was impressed with its slick interface and capable features. Unusual for a product not marketed to the pro user, the app includes Nvidia CUDA support, NVIDIA 3D Vision support, free cloud file sharing and storage with Box, and Red Giant plugins, to name just a few ways the app will differentiate itself in the market. While Corel makes VideoStudio, an NLE aimed squarely at consumers, the company won’t muddy the waters in selling the Studio line on its main website. Instead, plans are to keep Pinnacle Systems as a stand-alone division with major offices in Silicon Valley and Germany. That’s important, as the product incorporates rich DNA, going back to the original Pinnacle Systems of 1986. (Pinnacle Systems, the original company, didn’t launch an NLE until later.) Over the years, the product also benefited from acquisitions that included FAST MultiMedia and Miro, as well as spending seven years as an Avid product. The app’s support for Nvidia 3D Vision is a neat move for the product, though of course you will need an Nvidia graphics card, such as the Quadro or consumer-oriented GeForce. With such a card, you can edit and preview 3D work in both full-screen and window modes. Of course, actually showing such 3D for larger scale viewing requires a 3D-capable set, or Sony’s PS3. 3D is still rather unique in the world of NLEs, regardless of whether they’re consumer, prosumer or pro, although the latest version of Avid Media Composer addresses such editing. As mentioned before, Pinnacle Studio also takes advantage of the latest Nvidia CUDA enabled graphics cards for a fast editing and rendering experience. Each product in the Pinnacle Studio 16 family includes up to 50GB of free in-app cloud storage and file sharing via Box, allowing you to download media and project files from any browser. What might be more useful to many users is editing in the field on a tablet, specifically an iPad. Pinnacle touts its iPad app–Pinnacle Studio for iPad—as offering capabilities far beyond Apple’s version of iMovie for the iPad. Might be worth it for the producer on the go. iPad edits can then be transferred to a PC with the Studio 16 program to finish. As with Corel’s other products, Pinnacle Studio 16 includes extensive built-in video tutorials, in this case produced by Class on Demand. You also have the ability to import from a wide range of digital devices, while an innovative storyboard feature lets you lay out shots visually. You might also be interested in using the more than 2000 2D/3D effects, menus and animations; create custom-fitting soundtracks with Scorefitter; or make use of instant sharing via Facebook, YouTube, iPad, Apple TV and more. For $129, Pinnacle Studio 16 Ultimate not only delivers seven premium Red Giant plugins (including Trapcode Particular and Magic Bullet Looks) but you’ll be prepared for compositing via the included piece of green screen fabric. Not a bad place to be for an app that’s had a long and winding road from the pre-history of NLEs to today’s digital everywhere world. 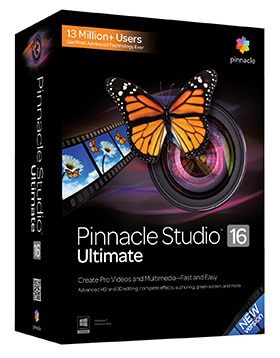 We’ll follow up with a more in-depth review of Pinnacle Studio 16 Ultimate sometime soon.